The Nakhichevan Autonomous Republic, known simply as Nakhichevan, is a landlocked exclave of Azerbaijan bordering Armenia, Turkey, and Iran. Armenian tradition holds that Nakhichevan was founded by Noah, of the Abrahamic religions. The oldest culture artifacts found in the region date back to the Neolithic Age (6000 B.C.E. to 4000 B.C.E.). This small territory with a population of less than half a million has seen a succession of rulers including Mannae, Achaemenid Persians, Macedonians, Armenians, Sassanid Persians, the Eastern Roman Empire, Arabs, Seljuk Turks, Safavid Persians, Russians and the Soviet Union. Widespread population resettlements under the Russian Empire, and a changing population mixture of Turkic Muslim Azeris and Christian Armenians over the past 180 years created a toxic ethnic brew that has exploded into violence on a number of occasions. Variations of the name include "Nachidsheuan," "Nakhijevan," "Nakhchawan," "Nakhjavan" and "Nakhdjevan," reflecting past rule by numerous powers. According to the nineteenth-century language scholar, Heinrich Hubschmann, the name "Nakhichavan" in Armenian literally means "the place of descent," a reference to the descent of Noah's Ark on the adjacent Mount Ararat. Hubschmann notes that it was not known by that name in antiquity, and says that the present-day name evolved to "Nakhichevan" from "Naxcavan." The prefix "Naxc" was a name and "avan" is Armenian for "town." According to other versions, the name Nakhchivan derived from the Persian Nagsh-e-Jahan ("image of the world"), a reference to the beauty of the area. Medieval Arab chronicles referred to the area as "Nashava." With an area 2124 square miles (5500 square kilometers), or less than one half of the size of the state of Connecticut in the United States, Nakhichevan is an atmospheric, semi-desert region that is separated from the main portion of Azerbaijan by Armenia. Nearly 75 percent of the territory has an elevation of 3280 feet (1000 meters). The Zangezur Mountains make up its border with Armenia while the Aras River defines its border with Iran. It is extremely arid and mountainous. Nakhichevan's highest peak is Mount Kapydzhik at 12,808 feet (3904 meters) and its most distinctive peak is Ilandag (Snake Mountain) at 7923 feet (2415 meters) which is visible from Nakhichevan City. According to legend, the cleft in its summit was formed by the keel of Noah's Ark as the floodwaters abated. The region has impressive volcanic domes. The climate is dry, continental, becoming semi-desertic in parts. Winter temperatures average 20°F to 24°F (-7°C to -4°C), while summer temperatures range from 75°F to 84°F (24°C to 29°C). Precipitation is low, even in mountain areas. 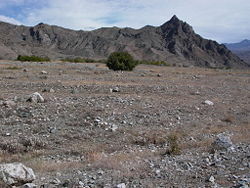 The scarcity of rain on the plain, which is less than 20 inches (500mm) annually, produces a steppe type of vegetation. The only area of forest is located near Bichanak. The flora consists of mountainous steppe, with dwarf oak and Iberian maple in the upper valleys. Sparse vegetation and intense bursts of rain often causes floods. The region regularly has strong earthquakes; that of 1931 having been particularly severe. Nakhichevan city, the capital, was an ancient trading center believed to be founded in the sixteenth century B.C.E. Legend holds that the city was founded by Biblical Noah. Nakhchivan city was home to over 60,000 inhabitants in 2007, when it had some industry, centered around glass, furniture, textiles and carpets, aluminum, tobacco and grape processing. Julfa, the administrative capital of the Julfa rayon, became extremely prosperous from the fifteenth to the seventeenth century because of the role its Armenian merchants played in international trade. The other chief city is Ordubad. The oldest material culture artifacts found in the region date back to the Neolithic Age (6000 B.C.E. to 4000 B.C.E.). The region was part of the Mannaean civilization, an ancient people of unknown origin, who lived in the territory of present-day Iran, around the tenth to seventh centuries B.C.E. It became part of Urartu, an ancient kingdom of Armenia that existed from around 860 B.C.E. until 585 B.C.E. The name corresponds to the Biblical Mount Ararat. Then it was under the Medes, an ancient Iranian people. It became part of the Satrapy of Armenia under Achaemenid Persia circa 521 B.C.E. After Alexander the Great's death (323 B.C.E.) various Macedonian generals tried to take control of the region but failed. A native dynasty of Orontids flourished until Armenia was conquered by Seleucid Antiochus III the Great, (who ruled from 223 B.C.E. to 187 B.C.E.). The Seleucid Empire was the Hellenistic successor of Alexander the Great's dominion. Kingdom of Armenia at its greatest extent under the Artaxiad Dynasty after the conquests of Tigranes the Great, 80 B.C.E. In 189 B.C.E., Nakhichevan was part of the new Kingdom of Armenia established by Artaxias I. Within the kingdom, the region of present-day Nakhichevan was part of the Ayrarat, Vaspurakan and Syunik provinces. The area's status as a trade center allowed it to prosper, though because of this, it was coveted by many foreign powers. According to fourth century historian Faustus of Byzantium, when the Sassanid Persians invaded Armenia, Sassanid King Shapur II (310-380) removed 2,000 Armenian and 16,000 Jewish families in 360-370. In 428, the Armenian Arshakuni monarchy was abolished and Nakhichevan was annexed by Sassanid Persia. In 623, possession of the region passed to the Eastern Roman Byzantine Empire. Beginning in 651, Arabs organized periodic marauding raids deep into the region, crushing all resistance and attacking Armenian nobles who remained in contact with the Byzantines or who refused to pay tribute. In 705, Armenian nobles and their families were locked into a church at Nakhichevan and by order of the governor, the church was burned with them inside. 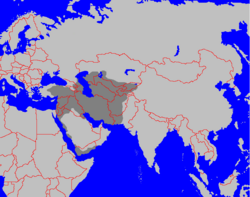 Central Asia came under Arab control by the early eighth century and was incorporated into Islamic Caliphate divided between provinces of Mawara'un Nahr and Khorasan. The Arab conquest brought Islam to the region. Eventually, Nakhichevan became part of the autonomous Principality of Armenia under Arab control. In the eighth century, Nakhichevan was one of the scenes of an uprising against the Arabs led by freedom fighter Babak Khorramdin. Nakhichevan was finally liberated from Arab rule in the tenth century by Bagratid King Smbat I and handed over to the princes of Syunik. In the eleventh century, the conquering Seljuk Turks became the dominant force in Azerbaijan and laid the ethnic foundation of contemporary Azerbaijanis. In twelfth century, the city of Nakhichevan became the capital of the state of Atabegs of Azerbaijan, also known as Ildegizid state, which included most of Iranian Azerbaijan and a significant part of South Caucasus. The Armeno-Georgian princely house of Zacharids frequently raided the region when the Atabeg state was in decline in the early years of the thirteenth century. It was then plundered by invading Mongols in 1220 and became part of Mongol Empire in 1236, when the Caucasus was invaded by Chormaqan. The fourteenth century saw the rise of the Armenian Catholic Church in Nakhichevan, though by the fifteenth century the territory became part of the states of Kara Koyunlu and Ak Koyunlu. In the sixteenth century, control of Nakhichevan passed to the Persian Safavid dynasty. In 1604, Shah Abbas I Safavi, concerned that the lands of Nakhichevan and the surrounding areas would pass into Ottoman hands, instituted a scorched earth policy. He forced the entire local population, Armenians, Jews and Muslims alike, to leave their homes and move to the Persian provinces south of Aras. Many of the deportees were settled in a neighborhood of Isfahan that was named New Julfa, since most of the residents were from the original Julfa (a predominantly Armenian town which was looted and burned). The Turkic Kangerli tribe was later permitted to move back under Shah Abbas II (1642-1666) in order to repopulate the frontier region of his realm. In the seventeenth century, Nakhichevan was the scene of a peasant movement led by Köroğlu against foreign invaders and "native exploiters." In 1747, the Nakhichevan khanate emerged in the region after the death of Nadir Shah Afshar. The Nakhichevan khanate, a feudal state that existed in the territory of the present-day Nakhichevan, emerged after the death of Persian ruler Nadir Shah Afshar. The khanate was ruled by local Azeri-Turkic Kangarli dynasty and the population of the khanate was mostly Muslim (Azeri-Turkic and Kurdish). It was founded in 1747 by Haydar Quli Khan, who declared himself the ruler of Nakhichevan. During the rule of Panah khan of Karabakh khanate Nakhchivan was the dependency of Karabakh. After the last Russo-Persian War (1826-1828) and the Treaty of Turkmanchai, the Nakhichevan khanate passed into Russian possession in 1828. The Tsarist authorities encouraged resettlement of Armenians to Nakhichevan and other areas of the Caucasus from the Persian and Ottoman Empires. In 1828, only 17 percent of Nakhichevan residents were Armenian Christians, while the remaining 83 percent were Muslims. After resettlement, the number of Armenians had increased to 45 percent while Muslims remained the majority at 55 percent. According to Russian envoy to Persia Alexandr Griboyedov, the number of Armenian population resettled to Nakhichevan in 1828 exceeded all reasonable limits, and this resulted in tensions between the newcomers and local, mainly Muslim, population. The Nakhichevan khanate was dissolved in 1828, its territory was merged with the territory of the Erivan khanate and the area became the Nakhichevan uyezd of the new Armenian oblast, which later became the Erivan Governorate in 1849. It roughly corresponded to what is now most of central Armenia, the Iğdır Province of Turkey, and Nakhichevan exclave. By 1897, there were 829,556 inhabitants. By the turn of the twentieth century in the Sharur-Daralagyoz uyezd, the territory of which would form part of modern-day Nakhichevan, Azeris constituted 70.5 percent of the population, while Armenians made up 27.5 percent. 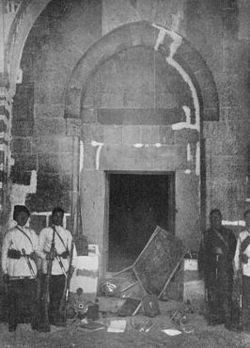 Armenian Church Plundered and Desecrated by Tartars. During the Russian Revolution of 1905, conflict erupted between the Armenians and the Azeris, culminating in the Armenian-Tatar massacres (1905 to 1907). This was the bloody inter-ethnic confrontation between the Azeris (which were then referred to as Azerbaijani or Caucasian Tatars in Russia) and Armenians throughout the Caucasus, then part of Imperial Russia. The events were caused by a lasting hostility between Muslim Tatars on one side and Christian Armenians on the other. They were allegedly incited by the Russian government in order to reinforce its own authority during the revolutionary turmoil of 1905. The massacres claimed hundreds of lives. After the February Revolution in Russia, in 1917, the region was under the authority of the Special Transcaucasian Committee of the Russian Provisional Government, then the Transcaucasian Democratic Federative Republic. When the TDFR was dissolved, in May 1918, Nakhichevan, Nagorno-Karabakh, Zangezur (today the Armenian province of Syunik), and Qazakh were heavily contested between the newly formed and short-lived states of the Democratic Republic of Armenia and the Azerbaijan Democratic Republic. In June 1918, the region came under Ottoman occupation, then occupation by the British. The British proposed a border settlement unacceptable to both Armenians and Azeris. In December 1918, Jafar Kuli Khan Nakhichevanski declared the Republic of Aras in the Nakhichevan uyezd of the former Erivan Governorate assigned to Armenia by the British. The Armenian government sent its troops into the region to take control of it. Conflict erupted, known as the Aras War. By June 1919, Armenia gained control over Nakhichevan. The fall of the Aras republic triggered an invasion by the Azerbaijani army and by the end of July, Armenian troops were forced to leave Nakhichevan City. Violence erupted between Armenians and Azeris, leaving 10,000 Armenians dead and 45 Armenian villages destroyed. Meanwhile, the British withdrew. Fighting continued between Armenians and Azeris. In March 1920, Armenian forces attacked the disputed territories and by the end of the month, both the Nakhichevan and Zangezur regions came under Armenian control. In July 1920, the Eleventh Soviet Red Army invaded, and on July 28 declared the Nakhichevan Autonomous Soviet Socialist Republic with "close ties" to the Azerbaijan SSR. In November, on the verge of taking over Armenia, the Bolsheviks, in order to attract public support, promised they would allot Nakhichevan to Armenia, along with Karabakh and Zangezur. Vladimir Lenin did not agree and called for the people of Nakhichevan to be consulted in a referendum, held in early 1921. In that referendum, 90 percent of Nakhichevan's population wanted to be included in the Azerbaijan SSR as an autonomous republic. The decision to make Nakhichevan a part of modern-day Azerbaijan was cemented March 16, 1921 in the Treaty of Moscow between the Soviet Union and the newly founded Republic of Turkey. This agreement also called for attachment of the former Sharur-Daralagez uyezd (which had a solid Azeri majority) to Nakhichevan, thus allowing Turkey to share a border with the Azerbaijan SSR. This deal was reaffirmed on October 23, in the Treaty of Kars. So, on February 9, 1924, the Soviet Union officially established the Nakhichevan ASSR. Its constitution was adopted on April 18, 1926. Under Soviet rule, Nakhichevan became important for mining salt, and as junctions on the Moscow-Tehran, and Baku-Yerevan railway lines. It was strategically important during the Cold War, sharing borders with both Turkey (a NATO member) and Iran (a close ally of the west until the 1979 Iranian Revolution). Education and public health began to improve. As part of the Soviet Union, Nakhichevan ethnic tensions lessened. The ethnic mix between Armenians and Azeris changed dramatically, as Nakhichevan's Armenian population gradually emigrated to the Armenian SSR. In 1926, 15 percent of region's population was Armenian, but by 1979 this number had shrunk to 1.4 percent. The Azeri population, meanwhile increased substantially with both a higher birth rate and immigration rising from 85 percent in 1926 to 96 percent by 1979. Armenians in Nagorno-Karabakh noted similar demographic trends and feared an eventual "de-Armenianization" of the area. In the summer of 1989, the Azerbaijan SSR instigated a partial railway and air blockade against Armenia, as a response to attacks by Armenian forces on trains entering from Azerbaijan. This effectively crippled Armenia's economy, as 85 percent of goods arrived by rail. In response, Armenia closed the railway to Nakhichevan, thereby strangling the exclave's only link to the rest of the Soviet Union. 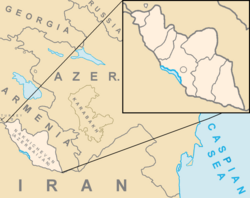 Further unrest appeared in Nakhichevan in December 1989 as its Azeri inhabitants moved to dismantle the Soviet border with Iran to flee the area. The Soviet leadership accused the Azeris of "embracing Islamic fundamentalism." On January 20, 1990, the Soviet army cracked down on an Azeri pro-independence protest in Baku, Azerbaijan SSR, an event referred to as Black January. Heydar Aliyev, who was later to become president of Azerbaijan, returned to Nakhichevan, his birthplace, in 1990. He had been ousted from his position in the Politburo by Mikhail Gorbachev in 1987. Soon elected to the Supreme Soviet, Aliyev resigned from the Communist Party of the Soviet Union, and after the failed August 1991 coup against Gorbachev, he called for independence for Azerbaijan. He denounced Ayaz Mütallibov, the first post-Soviet President of Azerbaijan, for supporting the coup. In late 1991, Aliyev consolidated his power base as chairman of the Nakhichevan Supreme Soviet and asserted Nachichevan's near-total independence from Baku. Nakhichevan became a scene of conflict during the Nagorno-Karabakh War. On May 4, 1992, Armenian forces shelled the area's Sadarak rayon. The heaviest fighting took place on May 18, when the Armenians captured Nakhichevan's exclave of Karki, a tiny territory through which Armenia's main North-South highway passes. Heydar Aliyev declared a unilateral ceasefire on May 23 and sought to conclude a separate peace with Armenia. A cease-fire was agreed upon. Despite a cease-fire in place since 1994, Azerbaijan has yet to resolve its conflict with Armenia over the predominantly ethnic Armenian territory. Since the end of the war, Azerbaijan lost control of about 16 percent of its territory including Nagorno-Karabakh itself. The conflict brought economic hardships and refugee problems for both countries. Nakhichevan, as an “exclave” of Azerbaijan, is geographically separated from the main territory by surrounding alien territory. Nakhichevan retains its autonomy as the Nakhichevan Autonomous Republic and is internationally recognized as a constituent part of Azerbaijan governed by its own elected parliament. A new constitution for Nakhichevan was approved in a referendum on November 12, 1995, adopted by the republic's assembly on April 28, 1998, and has been in force since January 8, 1999. Nakhichevan has its own parliament, known as the Supreme Assembly, a cabinet of ministers, and a supreme court. The President of the Azerbaijan Republic appoints the chairman of the Supreme Assembly, the top official of Nakhichevan, upon the recommendation of the Supreme Assembly. Vasif Talibov, who is related by marriage to Azerbaijan's ruling family, the Aliyevs, served as the chairman of the republic in 2007. He was known for his authoritarian and allegedly corrupt rule. Economic hardships and energy shortages result from Armenia's continued blockade of the region in response to the Azeri and Turkish blockade of Armenia. 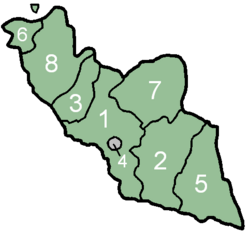 Nakhichevan is subdivided into eight administrative divisions. Seven of these are rayons. Its capital, the city (şəhər) of Nakhichevan City is treated separately. The rayons are: Babek, 1; Julfa, 2; Kangarli, 3; Nakhichevan City, 4; Ordubad, 5; Sadarak, 6; Shakhbuz, 7; and Sharur, 8. Examples of Armenian khachkars from Julfa. 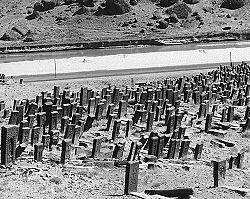 A photograph taken in 1915 by Aram Vruyr showing part of the medieval Armenian cemetery of Julfa. Armenia has accused the government of Azerbaijan of destroying historic Armenian headstones (khachkars) at a medieval cemetery in Julfa. Azerbaijan denies these accusations, asserting that the Armenian side started a propaganda campaign against Azerbaijan to divert attention from the destruction of Azerbaijani monuments in Armenia. The Institute for War and Peace Reporting, meanwhile, reported on April 19, 2006, that "there is nothing left of the celebrated stone crosses of Jugha.” The European Parliament has formally called on Azerbaijan to stop the demolition as a breach of the UNESCO World Heritage Convention. In 2006, Azerbaijan barred the European Parliament from inspecting and examining the ancient burial site. Meanwhile, Nakhichevan's parliament issued a non-binding declaration in the late 1990s recognizing the sovereignty of the Turkish Republic of Northern Cyprus and called upon Azerbaijan to do so. While sympathetic to the TRNC, Azerbaijan has not followed suit because doing so would prompt Greek Cypriot recognition of the self-proclaimed Nagorno-Karabakh Republic. The Aras River near the Julfa-Iranian border. Agriculture is the main activity, and major products include cotton and textiles, grapes, meat, silk, tobacco, and wheat. Although dry, irrigation, developed during the Soviet years has allowed the region to expand into the growing of wheat (mostly grown on the plains of the Aras River), barley, cotton, tobacco, orchard fruits, mulberries, and grapes for producing wine. Nakhichevan's industries include the mining of salt, molybdenum, and lead. Other industries include cotton ginning/cleaning, silk spinning, fruit canning, meat packing, and, in the more arid regions, sheep farming. Nakhichevan offers basic facilities and lacks heating fuel during the winter. Nakhchivan city has some industry, centered around glass, furniture, textiles and carpets, aluminum, tobacco and grape processing. The government was looking, in 2007, for investment to develop tourism and oil production. The city has a university and a significant scientific and artistic community, and attracts numerous business visitors from Iran, Turkey and Russia. The city is served by an airport and theoretically has good road and rail links, although the the Nagorno-Karabakh war has made access more difficult. As an autonomous exclave of Azerbaijan, Nakhichevan’s GDP, poverty, unemployment and trade statistics are part of Azerbaijan’s statistics. The territory shares all the problems of the former Soviet republics in making the transition from a command to a market economy. Other problems result from the continuing conflict with Armenia over the Nagorno-Karabakh region, and pervasive corruption. Most of the population are Azerbaijanis, who constitute around 99% of the population. Ethnic Russians and a minority of Kurds constitute the remainder. The remaining Armenians were expelled by Azerbaijani forces during the conflict over Nagorno-Karabakh. Religion in Nakhichevan is assumed to resemble Azerbaijan which, as a secular country, constitutionally guarantees religious freedom. Azerbaijan is 93.4 percent Muslim and most Azerbaijanis are Twelver Shia Muslim. They represent about 60 percent of the Muslim population. Zoroastrianism, which goes back to the first millennium B.C.E., and for at least 1,000 years remained the predominant religion in Azerbaijan, remains highly respected there, and Novruz, the Persian new year, continues to be the main holiday. The Azerbaijani language is a member of the Oghuz subdivision of the Turkic language family. Its closest relatives are Turkish and Turkmen. As a result of the language policy of the Soviet Union, Russian is commonly spoken as a second language among the urbane. In Azerbaijani society, men are the breadwinners, although there are no restrictions on women's participation in work and in public life. Women are most respected for their role as mothers, and women in rural areas usually control domestic and ritual life. Marriages are increasingly arranged according the partners' wishes. Economic security is a concern for women. As well as a civil marriage ceremony, some couples marry according to Islamic law. The domestic unit is either a nuclear family, or two generations in one household, tending to include the husband's parents. The education system reflects its Soviet past, higher education is valued, and literacy levels are high—98.8 percent aged 15 and over can read and write. Under Soviet rule, the urban merchant class and industrial bourgeoisie lost their wealth. An urban-rural divide is the most significant social stratification, although educational opportunities and principles of equality of the Soviet period altered this. Seventy years of Soviet rule left many examples of the plain and anonymous Soviet style of building. Numerous examples of earlier building styles remain. 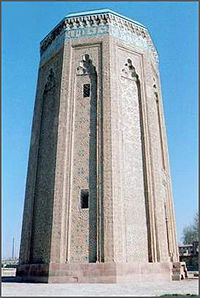 Nakhichevan city features the heavily restored twelfth century Momine Khatun Mausoleum. This 10-sided monument is decorated with intricate geometrical motives and Kufic script, and uses turquoise glazed bricks. Nearby statue of its architect - Ajami Nakhchivani - and a bust of Heydar Aliyev. Also from the twelfth century and by the same architect, is the octagonal Yusuf Ibn Kuseir tomb, known as “Atababa,” half-abandoned near the main cemetery. More recent (1993) is the white marble mausoleum of Hussein Javid, the Azeri writer who died in the Gulag under Stalin. Flat white bread is baked in rural areas. Kufte bozbash (meat and potatoes in a thin sauce) is popular, as is filled pepper and grape leaves and soups. Pulov (steamed rice) with apricots and raisins, a dish at celebrations, is eaten with meat, fried chestnuts, and onions. During the Novruz holiday, wheat is fried with raisins and nuts (gavurga). Baklava, a diamond-shaped thinly layered pastry filled with nuts and sugar, and shakarbura, a pie of thin dough filled with nuts and sugar, feature at celebrations. Nakhichevan has been mentioned in works of literature. Writers and poets include: M. S. Gulubekov and Mammed Said Ordubadi, both writers; Huseyn Javid, poet; Jalil Mammadguluzadeh, writer and satirist; as well as Ekmouladdin Nakhichevani, Hindushah Nakhichevani, and Abdurrakhman en-Neshevi, all medieval literary figures. The classical music of Azerbaijan is called mugam, and is usually a suite with poetry and instrumental interludes. The sung poetry sometimes includes tahrir segments, which use a form of throat singing similar to yodeling. The poetry is typically about divine love and is most often linked to Sufi Islam. 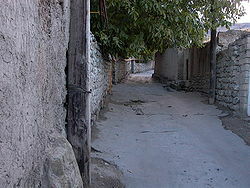 The famous narrow streets of Ordubad. The stringed instruments tar (skin-faced lute), the kamancha (skin-faced spike fiddle), the oud, originally barbat, and the saz (long necked lute); the reeded wind instrument balaban,, the frame drum ghaval, the cylindrical double faced drum naghara, and the goshe nagara (a pair of small kettle drums). Other instruments include the garmon (small accordion), tutek (whistle flute), and dhol (drum). Ashiqs are travelling bards who sing and play the saz. Dramatic performances staged by an amateur dance troupe were held in Nakhichiven in the late nineteenth century. The region has produced noteworthy Armenian artists including Soviet actress Hasmik Agopyan. In 1923, a musical sub-group was organized at the State Drama Theater (renamed the Dzh. Mamedkulizade Music and Drama Theater in 1962). The Aras Song and Dance Ensemble (established in 1959) is another famous group. The creative work of Jalil Mammadguluzadeh, M. S. Gulubekov, and G. Arablinski (the first Azerbaijani film director) have honorable mention in Nakhichevan's cultural heritage. All links retrieved November 5, 2018. This page was last modified on 18 November 2018, at 00:11.